I am not a big wine drinker. But, I do enjoy drinking it with a nice meal and if I host a dinner party it is always nice to know what to serve my guests. 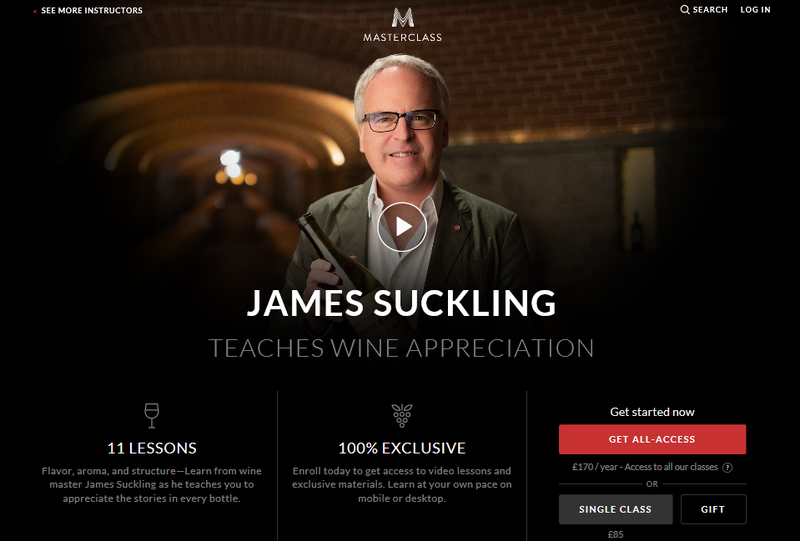 So, when I came across James Suckling Wine Appreciation course while looking through the culinary arts section of Masterclass.com, I was intrigued and took the class. It was interesting. I certainly learned a thing or two about wine and whiled away a few enjoyable hours while doing so. This first video was fascinating. Oddly, it was not about tasting wine. 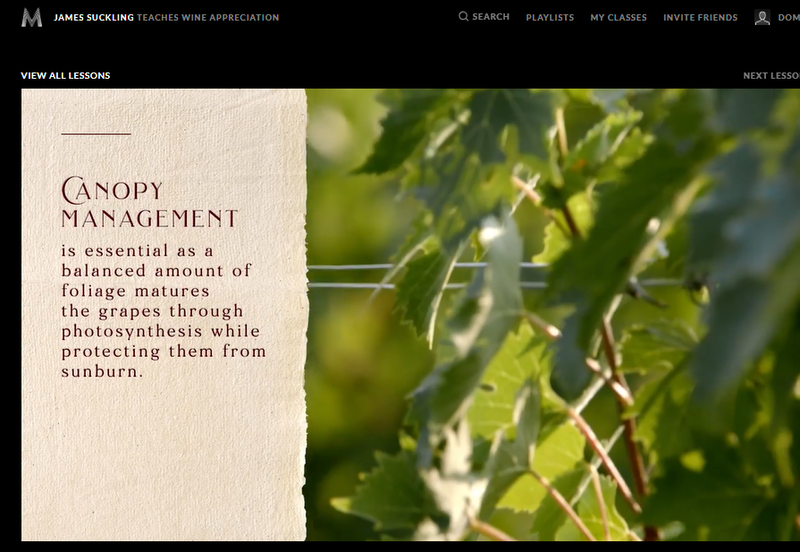 Instead, it teaches you about the vineyard and the conditions needed to grow the perfect grapes. For example, James shares information like why vines do so well in places with low levels of rainfall. He also explains how placing stones around the base of the vine reflect the sun and absorb the heat., which keeps the roots warm. Both of which are good for the grapes. Oddly, for this lesson, it was the workbook that I learned the most from. The video lesson was interesting, but the written information was better organized and made the point in a more concise way. I especially liked the terms section. It helped me to understand what James was saying. Therefore, I would recommend that you download it before you watch the video. In fact, doing that before each and every video may help you to get more out of the course. Naturally, throughout this course, James uses tasting terms. It takes a while to get used to them. In fact, you might not fully understand what he is talking about until you start actually tasting the wines yourself and remember one of the adjectives he has used. Then things will click more. My favorite term was “a wet dog in a phone booth”. Hopefully, that is one you never experience, because if you do taste that you will have to send the wine back. It usually means the grapes used to make the wine have some sort of fungal infection. When tasting wines, James Suckling uses a special scoring system. He explains it, in full, during his masterclass course. I can’t really share the system in its entirety here because I am pretty sure masterclass.com and James would not be very pleased if I did. But, what I can tell you is that this grading system is really easy to understand and use. 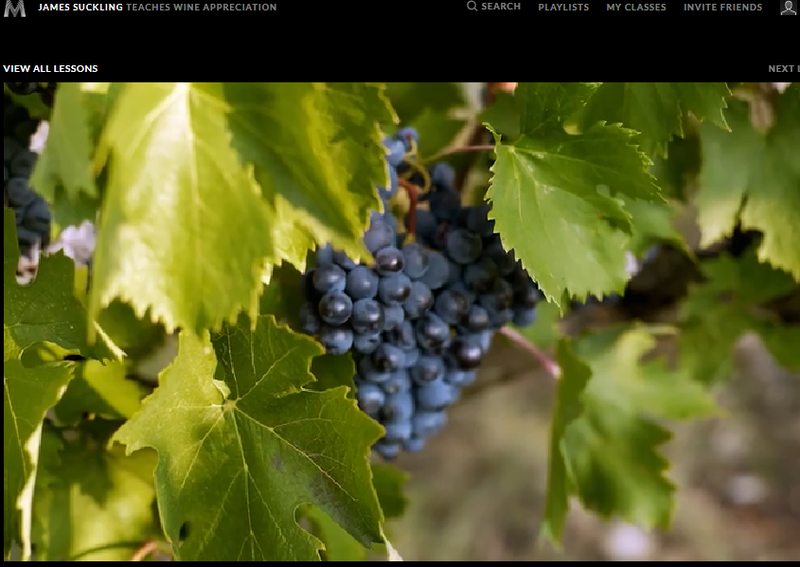 In this section of the course, James explains how to set everything up consistently, so that you can make a fair comparison of a range of wines. It was interesting to hear that James does not taste all wine blind. But, for someone who is just starting out, it is definitely a good way to focus on what is in the glass. This section of the course consists of two fairly long videos. The first is an introduction to tasting followed by a short tasting session, with his son. It is OK, but to be honest I got a bit lost during this bit. It was interesting to watch him and his son tasting wines, but I could not really understand what he was trying to teach me. The words made sense but I did not have enough experience of wine tasting to recognize what he was describing. 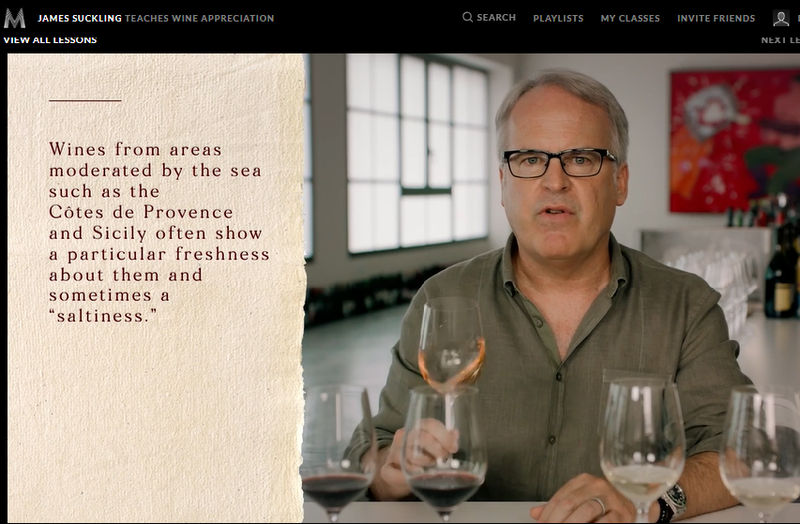 Oddly, the 2nd video, when he tasted a selection of wines with some of his students made a lot of more sense to me. I picked up on the need to recognize the flavors as they developed in your mouth. Naturally, the moment you take a sip you taste something instantly, then after a second, the next flavor followed by several others can be picked out. Now, when I taste a new wine I pay far more attention as the flavor develops in my mouth and, as a result, I enjoy it far more. Again, the best tips are actually contained in the workbook. For example, the correct order to carry out a wine tasting- sparkling followed by white, rose and finally red. The student’s questions were interesting too. He also explains little things like why many modern wines do not typically have a very deep color. What he thinks of screw cap wines and why was also interesting. In this video, James introduces you to Albiera Antinori who currently heads up Marchesi Antinoro Srl. This is one of the oldest winemakers in the country. They have been making wine here since the 1300s. It is their legendary Super Tuscan Tignanello that James tastes in this video. One bottle from each decade. A method that is known as a vertical tasting. This proved to be an interesting way to trace the evolution of this very famous wine. During this video, you get to understand how changing weather conditions and consumer tastes influence the way the wine is finished. The attention to detail is amazing. For example, weeding more if the rains do not come so that the vines have access to more of the nutrients that are locked in the soil. Or using different types of vats depending on the age of the vines. This section explains the role oak barrels play in creating wines. In this video, James tastes wine direct from the barrel. What is the right temperature to keep wine? What is the right humidity for wine? What wines to put in your cellar? This video explains how to read a wine list and the etiquette of choosing a wine for the table. To do this well, you need quite a good memory. For example, remembering things like the fact a 2015 red burgundy is excellent will help you to narrow down your options and avoid disaster. However, my memory is not that good, so instead, I think as James suggests I will be looking at the wine list online before going to the restaurant. Planning ahead makes a lot of sense especially when you are spending a lot of money on wine. This section also contains information about up and coming wine regions and some of the latest vintages. This is an interesting idea. We will certainly be trying out restaurants that sell by the glass. You pay more, but it is a good way to reliably identify a bottle of wine that will taste great with your meal. In addition, some establishments now offer wine flights. Three very small glasses of wine that enable you to taste just a couple of mouthfuls. An even more reliable way of selecting the right wine as well as a great way to taste and experience more wines. I was a bit disappointed by this section. It was not extensive enough. With luck, James will produce a course that covers the subject of pairing wine with various type of wine. A lot of the other A-list instructors have produced more than one masterclass, so James might. That is part of the reason I invested in one of their all-access passes. For $180, you can take all of the masterclass.com classes, which is a bargain because there are already 50+ available. You can find out more about these fantastic courses by reading my full masterclass review. This part of the course is specifically about choosing wines for a Tuscan lunch. The one tip I did come away with from this section of the video was to forget about the color of the wine. There is no need to only use white wine when eating fish. I will also be trying more reds with spicy food. Overall, I enjoyed this course. Wine tasting is very hard to teach using the written word and videos. So, I was probably expecting way too much from this course. I learned quite a bit, but not as much as I would have liked to about how to taste wine. However, the course has made me think and encouraged me to buy and enjoy more wine. Without a doubt, we will be taking more wine tours and maybe even joining a wine tasting club, if we can find one in our area.